Kobunboku is an incredible sandalwood incense that is particularly suited for meditation practice. The Japanese word "Ko" means Nice, "Bun" means Elegant, "Boku" means Wood or Tree. "Byakudan" translates as " White Sandalwood" and is made of fine Indian Sandalwood. 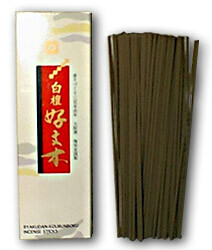 This incense contains a higher proportion of sandalwood than regular Kobunboku.